* Iron on low heat. Gamma LT Jacket - Mens is rated 4.3 out of 5 by 17. Rated 5 out of 5 by Ilmari from Very tough fabric, good for layering I've had this jacket for a couple of years now and it's my favorite. It still looks new, although I've used it a lot and climbed many routes with it. The fabric is really tough and durable. I like the overall minimalist and practical design. The jacket is not insulated, but it blocks wind very well and still gives you some warmth. If it gets cold, I just add layers under it. In summertime I use a t-shirt and the jacket. Most softshells are too hot to climb with, but not this one, unless the temperature gets close to 20 degrees Celsius, and then you wouldn't want to wear a jacket anyway. Huge pockets that are easy to access are a great advantage. Rated 5 out of 5 by Lipton14 from extremely versatile... I have only had this one for a few months but have found it to be extremely versatile. First, I'm 6'4", 200lbs (34"waste; 44" chest; 36"sleeve) and the large fits me perfectly. I have used it in weather ranging from 50-degrees with a t-shirt underneath to 25-degrees with a warm base layer underneath. I don't have a lot of extra room with the large, so for me, a close fitting base layer is necessary. I've used it for running, hiking, and climbing in a variety of weather. It breathes extremely well, which is rare for a soft shell that also sheds water as well as this one does. The only other soft shell I've had was from Marmot. It doesn't fit nearly as well and thus I haven't worn it much. All the stuff from Arc'teryx is relatively expensive but I haven't found anything that is better fitting or better quality. Rated 4 out of 5 by Snappy from Difficult sizing Great jacket, material is perfect. However as mentioned by other reviewers, sizing can be an issue. More specifically for me the arms. I have a few large Arc shirts, large Gamma MX hoody and a medium Alpha SL jacket. I tried a large and medium. Medium was too tight in the pits area and upper back and the large's sleeves were too long. Kept the large but need to roll up the sleeves. The sleeve design on the MX was perfect since it kept them from dropping down but this design does not (altough the material is different). otherwise very functional jacket. Wish I would have waited for the new colours. Rated 5 out of 5 by midwestnomad from Perfect all around jacket I have now owned this jacket for around 2 years and absolutely love it. I originally thought I would use it primarily for climbing/outdoor pursuits in milder clims, but liked it so much more than my other options that it has evolved into my go to jacket for everyday. The fabric is incredibly durable, with no significant sign of wear after continual use for two years. The water repellency has started to fade a bit in dirtier areas where skin oils reek havoc like sleeve and neck cuffs, but overall I have been very impressed with its ability to bead water (this is a softshell after all). I wouldn't trust it in a downpour, but it will keep you plenty dry in a light drizzle. The jacket material has great stretch and breaths well. I now bike into work in mine 200 days or better a year. Zip up the pockets if it is on the cool side but open them up and the mesh lining provides a great vent. The longer cut in the back is also nice to protect one from road nastiness thrown up in the rain. The fit is relatively snug (especially wrists and underarms) so purchase a bit bigger if you are planning on layering, but personally I feel the beauty of this piece is you can wear it on a cool summer evening over a T-shirt or over a long sleeve flannel in the fall and as long as you stay moving it is more than enough right down to 40 F. Again, love the jacket, still get jealous comments from friends about it on regular occasion. Will replace it immediately if I ever manage to trash this one, which will be a hefty endeavor. Rated 5 out of 5 by gtmutiny from Absolute machine of a jacket- used and abused for 8+ years This softshell is an everyday workhorse. I've worn one on a regular basis from 2005 to 2013. The only major repair it ever needed was a new front zipper after 5 years of wear and tear hiking and motorbiking through South and Southeast Asia as well as East and West Africa. I do wish this one had more pockets like the MX and when it gets very cold, you need an underlayer on this one unlike the MX. With that said, this one is very useful for hiking in chilly and wet climates and won't underheat you. It does fit a little long on the sleeves and doesn't have velcro wraps like the MX. So if the sleeves are long on you, you are sort of screwed and might want to return it and grab one with wrist tightening cuffs. Still, I can't tell you how much use this jacket has gotten and it is still kicking. If you send this in to Arcteryx for repairs every once in a blue moon, it will probably last forever. Rated 4 out of 5 by bkmy from Super nice if it fits you! I ordered both a small and medium of the Heron colour. I cant say much about long term usage but at a first impression the material felt very tough. tougher than i was expecting for sure. i wouldn't worry at all about ripping the fabric with regular use. Unfortunately i am an inbetweener for arctery softshells. i also tried small and medium with the gamma mx jacket but for both the small was too tight in the armpits and while a medium for the armpits and chest was good, there was too much bulk at waist and hips. i had to return them unfortunately. I guess me and arcteryx softshells arnt meant to be! But i wanna help you guys with your sizing. Uploaded photos for reference (im wearing the small). and heres my dimensions. doesn't help much when people say what size they got without stating their dimensions. - 5 foot 8 - 39.5" chest - 28.5" waist - 37" hips Everything else fit great on the jacket. it was just those tight armpits. I will either have to grow or shrink if i want to wear one of their softshells. I should mention too that i was worried about it being "waist length" rather than "hip length" but it was fine, especially with the drop back hem. I ordered a squamish hoody now as it has a "relaxed fit", and the gamma lt has an "athletic fit". I hope the pics helped someone out there! Rated 5 out of 5 by Dan78 from Winter sub-alpine shell Nearly all of my winter hiking takes place in the White Mountains in New Hampshire. While I'm almost guaranteed to be wearing a hard shell above treeline, before (and after) that point a significant portion of each hike takes place below the alpine zone. It's during these phases that small changes in terrain and weather conditions result in significant fluctuation in body temperature. I found I was frequently adding/removing mid layers or my hard shell depending on my level of exertion, the amount of wind, and whether there was any precipitation. This was getting tedious, and forcing me to stop more often that I wanted to. 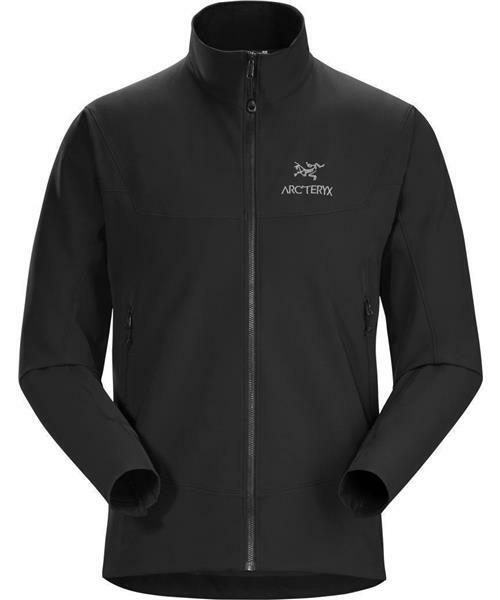 Although Arc'Teryx advertises this as a 3-season jacket, I've found it's exactly what I was looking for to solve my winter problem. It's not insulated, which means I don't overheat when the hike gets more aggressive. It offers reasonable wind protection when the breeze picks up. It keeps light precipitation from soaking in. It's very breathable. And as a small bonus, the material is stretchy enough that I can keep my sleeves rolled up comfortably when I need to make small adjustments to skin exposure to regulate temperature. But to keep things realistic, this jacket is not meant for high wind, or very cold temperatures. I treat this jacket as an ideal way to keep some of the elements off me when going in just a base-layer is too cold/wet, and even a light mid-layer is too much insulation. Bottom line: Instead of making frequent stops below treeline to adjust my layers, I can wear a base layer plus this jacket for almost the entire sub-alpine portion of the hike. I can make small adjustments by zipping or unzipping the front, and taking the sleeves up and down. In short, the conditions vary a lot more either way before I'm forced to stop and adjust my layers.